Steel (John Henry Irons) also known as the Man of Steel is a fictional comic book superhero in DC Comics. Introduced in 1993 as one of several replacement characters for the then-deceased Superman, Steel continued to be an independent superhero after Superman's resurrection. He received his own ongoing series, which saw him move from Metropolis to Washington, D.C. and join the Justice League of America in Grant Morrison's JLA. He later mentored his niece Natasha Irons, who became a superheroine herself. John Henry Irons as Steel, as seen in the "Reign of the Supermen" story arc. Art by Jon Bogdanove and Dennis Janke. First appearing in The Adventures of Superman #500 (June 1993), he is the second character known as Steel and was created by Louise Simonson and artist Jon Bogdanove. Aspects of the character are clearly inspired by the African American folk hero John Henry, as well as Superman. Doctor John Henry Irons was a brilliant weapons engineer for AmerTek Industries, who eventually became disgusted when the BG-60, a powerful man-portable energy cannon he had designed, fell into the wrong hands and was used to kill innocent people. As the company would have coerced him to retain his services, John faked his death, and eventually came to Metropolis. His own life was saved by none other than Superman. When John Irons asked how he could show his gratitude, Superman told him to "live a life worth saving". During Superman's fatal battle against Doomsday, Irons attempted to help Superman fight the deadly menace by picking up a sledge hammer, but was buried in rubble amidst the devastation. Shortly after Superman's death, he finally awoke and crawled from the wreckage, confused and saying that he "must stop Doomsday". He recovered, but to discover that the gangs in inner-city Metropolis (now unopposed by Superman) were fighting a devastating gang war using BG-80 Toastmasters, an upgraded version of his earlier AmerTek design. Irons created and donned a suit of powered armor in Superman's memory in order to stop the war, as well as the weapons, which were being distributed by Dr. Angora Lapin (also known as the White Rabbit), a former partner and lover during his time at AmerTek Industries. The various incarnations of Steel, on the cover for Superman: The Man Of Steel #117. Art by Doug Mahnke. The "Reign of the Supermen" story arc saw the rise of four "Supermen" who were differentiated from each other with nicknames previously applied to Superman; Irons was referred to as the "Man of Steel", which was later shortened to "Steel" by Superman himself. Although Steel never claimed to be the "true Superman", Lois Lane seriously considered the possibility that he was a walk-in—someone who was now inhabited by Superman's soul. Lois met all four "Supermen" that appeared after the apparent death of Superman, and while she never concluded that any of them was the one true Superman, she evinced less skepticism of Steel than she did of the others. Steel was spin off into a solo series, written by co-creator Louise Simonson and later by Christopher Priest, from 1994–1998. The series began by having Steel leave Metropolis and return home to Washington, D.C., revealing that it had been five years since he had left. He erroneously believed that his old employers, AmerTek, would no longer be interested in him. This turned out to be false when they attacked his home. Between this attack and his knowledge that the Toastmasters were now being used on the streets of D.C., he reforged his armor (it was now stronger than ever); he began his crusade against AmerTek, which he correctly knew was responsible for leaking the weapons onto the street. Steel decided not to use the "S" emblem, however, since he felt that his battle might take him outside the law. Steel's family was introduced in this series: his grandparents, Butter and Bess, his sister-in-law Blondell, and her five children: Jemahl, Natasha, Paco, Tyke, and Darlene (the latter two being foster children). Steel's early adventures pitted him against AmerTek and against the gangs that were using his weapons. His nephew, Jemahl, was involved in one of the gangs, which he thought offered him protection. He was proven wrong, however, when the gangs turned against him to get to Steel. Tyke was paralyzed by a bullet meant for Jemahl and Blondell was assaulted. Steel eventually took down AmerTek and the gangs, and focused on who was helping AmerTek distribute the weapons. This led him to track down a group called Black Ops, led by the villain Hazard. Tragedy would strike the Irons family upon his return from space. Tyke, frustrated and angry over his handicap, revealed Iron's true identity to men working with Hazard. Hazard unleashed a cyborg named Hardwire, who opened fire on the Irons family. Most of them received minor injuries, though Butter was seriously wounded. Child protective services came to reclaim Tyke and Darlene. Tyke was later shown to end up in the custody of Hazard. Hardwire battled Steel at the Washington Monument, resulting in Hardwire's suicide. Steel had to send his armor away to save his life—this resulted in his secret identity being revealed to the world at large. Steel was then taken by Hazard, but managed to escape. Steel retrieved an anti-matter weapon called the Annihilator, which he had designed and hidden years before, for his showdown with Hazard. He also learned at this point that he could teleport himself, not just his armor. He destroyed Hazard and his lair, and apparently killed three young soldiers of Hazard in the battle. Once Steel's identity was out, his family had no peace. They were harassed by neighbors and mobs. Then they were attacked by Doctor Polaris, Parasite, and others. John Henry's beloved grandmother, Bess, was killed and the family was forced to go into hiding, relocated by a friend of Steel's called Double. Steel learned that the three Black Ops agents were not truly killed. They briefly joined him in battling a monstrous, animated form of his armor that attacked him. Steel speculated that the armor came alive because of his own guilt and the strange teleportation effects. He managed to banish the monster and recall his true armor. The title received a shakeup when Christopher Priest became the lead writer for issue #34. Steel relocated to Jersey City, New Jersey with Natasha and began to work at Garden State Medical Center. He built a new suit of armor that was significantly less powerful than the previous one (but featured the return of an kryptonian peace symbol on his shield on it). While in Jersey City, he clashed with Dennis Samuel Ellis, a resident at Garden State Medical and rival for the affections of another colleague, Amanda Quick. Hospital administrator and gang leader Arthur Villain (pronounced "Will-hane") recruited Ellis to become his personal bodyguard. Given a suit with several hidden weapons, Ellis adopted the name "Skorpio" and became a recurring nemesis for Steel. Eventually Steel was reunited with his brother Clay, a hitman whom everyone assumed had been killed. Clay assumed the alias "Crash" and managed to acquire a pair of Steel's flightboots before turning himself in so that he could save his daughter Natasha when she needed a blood transfusion. The series was canceled after issue #52, which featured Steel running the hospital after the unmasking of its previous coordinator, Villain. During the Worlds Collide crossover series between DC and Milestone Media, Steel encountered his Milestone counterpart Hardware. Each hero questioned the other's motivations, Steel believing Hardware to be too rebellious and Hardware believing Steel to be too trusting and naive. Around the time the Steel series was cancelled, Steel was recruited as a member of the Justice League, due to Batman's concern that the League was already top-heavy in brawn and required more thinkers. During his time in the League, Steel played a crucial role in the defeat of villains such as Prometheus and the Queen Bee. He even served as the leader of the reserve team—consisting of Huntress, Barda, Plastic Man, and Zauriel—left in the present during the DC One Million crisis. Following the battle against Mageddon, he ceased to serve as a full-time member of the League, although he stayed on as a supporting member for quite some time. He also became a regular member in the Superman titles, having relocated with Nat to Metropolis to run his own workshop there, called "Steelworks." He also revealed at this time that he had known Superman's identity for some time. The two became partners of a sort, and John Henry helped Superman build a new Fortress of Solitude, although he maintained some contacts with the Justice League, as shown when he was able to contact Batman to help Superman find Lois Lane after she had been abducted by the Parasite. Steel retired from active duty during the Imperiex War after he was injured while wearing the Entropy Aegis, an alien armor created on the evil planet Apokolips; it nearly consumed his "soul" after he was taken by the Black Racer while attempting to release Doomsday and use him against Imperiex. Superman eventually confronted Darkseid in single combat with the aid of the rest of the Superman family to keep Darkseid's other forces delayed, requesting only that Darkseid release Irons from the Entropy Aegis after his defeat in exchange for him never sharing the results of this battle with anyone, although they had to rush Irons back to Earth for urgent medical attention as he was restored in the same physical state he'd been in when he was placed in the armor, and it was speculated that the injuries would prevent him ever becoming Steel again. During his retirement, Irons made a suit of armor for his niece Natasha, who became the new Steel. Although he was no longer actively fighting crime, he remained an important ally of Superman. He unintentionally usurped the position of Emil Hamilton as Superman's technology guru, one of several developments that led to the emergence of Ruin. John Henry Irons donned his armor once more in the wake of the Battle of Metropolis during Infinite Crisis. Along with most of Earth's united heroes, Steel helped defeat the Secret Society of Super Villains in Metropolis, but became bitter with life and a perceived narcissism within Earth's superhero community. After the disaster, John baited Natasha into an argument in which he prevented her from leaving Metropolis to join the Teen Titans. Irons refused to let her go and ordered her to continue collecting all the debris in the city, culminating in him destroying her armor in spite. He later identified a recently discovered corpse as that of a Lex Luthor from a parallel universe, Alexander Luthor, Jr., exonerating the real Lex Luthor from all of his recent crimes. A week later, at his Steelworks facilities, John Henry appeared to be hallucinating due to the effects of an unknown metabolic toxin. His flesh seemed to be in the middle of transforming into metal just before the lab exploded. Three days later, Steel, again wearing his armor, was called in by Doctor Mid-Nite to help him with the wounded heroes returned from space after the Crisis. He used Pseudocytes to aid in Mal Duncan's recovery. With the help of Kala Avasti from S.T.A.R. Labs, Irons learned that he had been injected with a small dosage of Lex Luthor's new exo-gene therapy, causing his skin to mutate into stainless steel and back again. He returned to Steelworks to find Natasha attempting, and failing, to build a new suit. Unaware of the truth, she accused him of hypocrisy for accepting Lex's exo-gene treatment. Three days and two nights later, Irons appeared, transformed into a man of living steel, at a party held by Lex Luthor. In a rage, he attacked Luthor, demanding to see Natasha and threatening or endangering anyone who got in his way. However, Natasha herself soon appeared, to stop John before he could kill Luthor. Natasha then single handedly beat the enraged John until he came to his senses. He admitted that Natasha was right to stop him from killing Luthor, but maintained that he was right, too. He then asked Natasha to "give it up, come home". Natasha responded by punching John repeatedly and sending him flying into the Metropolis bay. He reappeared several weeks later, having built a new suit of armor for Natasha, to make up for his behavior toward her, but had an emotional breakdown on realizing that it was too late to make amends. He later returned to active duty saving lives, and discovered from Kala that the exo-gene therapy allowed Luthor to take away any powers he had given. He then shared his suspicions with the Teen Titans and a former test subject who had had his powers stripped away. Investigating the Everyman Project on Thanksgiving along with Doctor Mid-Nite, Beast Boy/Changeling, and Kala, John discovered that his metal skin was peeling off and realized that the exo-gene therapy granted powers only for a limited time before they disappear completely. In 52 Week 40, after Natasha's capture by Luthor, Irons, in his full armor, led the Teen Titans—Raven(Daughter of Trigon, The lord of the Underworld) Beast Boy/Changeling, Aquagirl, and Offspring—in an open assault on LexCorp. After defeating armed robot guards and Infinity, Inc., Irons, with his armor destroyed, engaged Luthor in battle. But Luthor, having gained similar abilities to Superman's, thrashes Irons. Natasha used Irons' sledgehammer to create an electromagnetic pulse that shut down Luthor's exo-gene, and Irons defeated him. In 52 Week 47, John and Natasha reestablished Steelworks. Steel was one of the main characters of the Infinity Inc. vol. 2 series, which debuted in September 2007. A year after the end of the Every-man Project. Natasha is living with her uncle John Henry Irons and is in psychotherapy along with Erik, who refers to it as "our national religion" and Gerome. Another long-term patient, teenager Dale Smith, attacks his therapist and realizes his powers as a psychic vampire. Smith takes the name "Kid Empty". Apparently, a side effect of the exo-gene therapy is that once the exo-gene itself is suppressed, the energies unleashed by the therapy remains, re-enabling the metagene in a different fashion. As a result, Natasha finds herself turning to a mist-like substance, McKenna gains the ability to duplicate himself, and Storm gains a powerhouse, overconfident, female alter-ego. The group gains new members in Mercy Graves and Lucia, an Every-man subject who can psychically inflict pain on others. In issue #8, the team gains official costumes and code names, and go on their first mission. Upon the much solicited ending for the series, the Infinitors are kidnapped by the Dark Side Club, as due to the exo-gene therapy, they're unpredictable and undetectable by Apokoliptan technology, and a wild card in the upcoming Final Crisis. Irons vows to scour the Earth for his niece. In recent months, Irons has been working with Bruce Wayne/Batman, Zatanna, Mister Miracle, the Metal Men, and assorted other technical geniuses in creating a new body for Red Tornado. Unfortunately the Amazo program infected the new body. Working together, Wayne and Irons used the Justice League of America's teleportation doorways to send Amazo (an android with the power to use other peoples powers) into a red sun, after which they completed a new body for the Red Tornado (an android with the power to make gusts of wind come out of his arms and torso). John Henry Irons has made multiple appearances in the regular Superman series by James Robinson. He is attacked by the villain Atlas and rendered comatose. While in the hospital, his technology is used to keep the damage to Metropolis from being repaired. He plays a part in the War of the Supermen event, where he helps Superboy, the Guardian(James Harper), and Natasha bring down Sam Lane's conspiracy. He has a rematch with Atlas, whom he defeats. In January 2011, Steel featured in a one-shot comic, written by Doctor Who novelist Steve Lyons. Sean Chen was initially announced as the artist, but due to scheduling problems, Ed Benes took over the art duties. Steel finds himself the only person who can defend Metropolis from an attack by Doomsday. During the battle, Doomsday inexplicably develops metallic armor and the power of flight, countering Steel's own abilities. Steel attempts to immobilize Doomsday with nanites, but he quickly overcomes them, and badly beats him. Doomsday then picks up Steel's prone form and flies off with him. When Steel awakens to find himself in a dimensional prison with Superboy, Supergirl, the Eradicator, and Hank Henshaw/Cyborg Superman(David Harewood from the CW's Supergirl) all of whom have been captured by Doomsday, he speculates that Henshaw was included in the group to keep them divided and prevent them working together to find a way of escaping. Their subsequent exploration of their prison reveals that they were actually captured by clones of Doomsday created by Lex Luthor to distract Earth's heroes while he sought the power of the Black Lantern Ring(The Lantern of Death) each Doomsday clone designed to eliminate the Superman it was sent after. In September 2011, The New 52 rebooted DC's continuity. In this new timeline, John Henry Irons first appears in Grant Morrison's Action Comics as a young scientist working on the government's "Steel Soldier" program. He retaliates after seeing the mistreatment of Superman by Lex Luthor (who was under the command of General Sam Lane to torture him). Irons immediately quits. When John Corben goes on a rampage after donning the government's "Metal 0" suit, John Henry aids Superman in fighting him off by using his own prototype armor for the first time, uploading a virus into the Metal 0 suit that he designed specifically to shut it down in the event of the user going rogue. Brainiac used Doomsday to infect Superman and distract the world as Cyborg Superman and himself tried to steal the minds of every person on earth. As that transpires Steel teams up with Lana Lang to help Superman and stop Brainiac. Afterwards Lana and John began to date. Steel is recruited when Warworld appears above the Earth. He is partnered with Batgirl and secretly inserted onto the planet in order to neutralize its main threat, a planet cracking gun. They manage to do so with moments to spare. John Henry Irons is an engineer, and a natural athlete who frequently displays an impressive degree of strength. In addition, he wears a suit of powered armor which grants him flight, enhanced strength, and endurance. Steel modified his suit many times through his career. The initial "Man of Steel" design was armed with a wrist-mounted rivet gun and the sledgehammer (like the one used by his namesake John Henry) that was ubiquitous for most of his designs. The original design on his breastplate featured a metal version of Superman's "S" insignia in tribute to the (temporarily) deceased hero, which Irons removed after the return of Superman. Two later armor designs incorporated a similar, but different, "S" symbol. A large hammer is also a key weapon in the suit's arsenal. His most current "smart hammer" hits harder the farther it is thrown, is capable of independent flight, and has an on-board computer guidance and analysis system capable of detecting a target's stress points. When he wore the Entropy Aegis, he had god-like strength and durability and could enlarge himself to giant size. He also had the ability of flight due to energy wings, could travel through time and space at will, and could fire blasts of energy that would reduce a target to its composite elements. However, the Aegis made him very violent and was slowly erasing his soul. In the DC Comics miniseries DC: The New Frontier, a black man, John Wilson, takes on the name "John Henry" while donning a black hood secured by a hangman's noose and produces a sledge hammer in an attempt to avenge his family, who were murdered by the KKK. He kills two Klansmen and injures many more before being injured; while hiding in a barn he is discovered by a young white girl. He is then killed by the Klansmen. John Henry Irons is seen in the epilogue reading near John Henry's gravestone. This serves to further emotionally connect the hero Steel and his namesake to the folk hero. In the events of the Elseworlds' Kingdom Come series, Steel is seen to have joined Batman's faction, due to Superman's self-imposed exile. His suit now owes its stylings to Batman, rather than Superman, and he carries a Bat-shaped axe rather than his hammer. In the story "Hyper-Tension", in the comic Superboy vol. 3 #62, it shows a Steel in an alternate reality who joins Black Zero, an alternate adult version of Superboy (Kon-El) in a war for clone rights. In an Elseworlds tale featured in Steel Annual #1, "Steel: Crucible of Freedom", John Henry is a slave and blacksmith who builds a suit of armor for his master to fight in the Civil War. However, as his master will not sit for measurements, John is forced to fit the suit to himself, and uses it to lead the slaves in a revolt when his infant son and the children of the other slaves drown due to the carelessness of the Overseer. The story's epilogue tells how, after years spent fighting for his fellow slaves' freedom and traveling the expanding United States, this John Henry goes on to become the "steel drivin' man" of American folklore. In the crossover Superman vs. the Terminator: Death to the Future, Superman was temporarily transferred into the future of the Terminator universe, where he encountered an older version of Steel who fought alongside John Connor's resistance against Skynet as one of the last costumed heroes, noting that many heroes died in Skynet's attack and he operated on his own until meeting the Resistance. 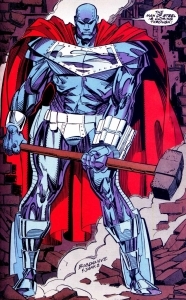 Although old by this point, Steel remained as intelligent as ever, having fitted his hammer with a voice-activation and anti-gravity unit that allowed him to call his hammer to him in the event he was ever captured, using this ability when he and Superman are briefly captured by Skynet. In the prequel comic to Injustice 2, it's revealed that John Henry died when the Joker nuked Metropolis. His niece Natasha became the new Steel in his place. When the president-elect asked her if she was comfortable wearing Superman's symbol after the impact the Regime left on the planet, Natasha tells him that it's her uncle's symbol and that she wears it for him. In the JLA/Avengers crossover, Steel plays a minor role, developing a battery pack for the Flash so that he has access to his powers while in the Marvel Universe—since the Speed Force does not exist in the Marvel Universe, Steel's device allows Wally to "absorb" Speed Force energy while he runs in the DC Universe that he can use when in the Marvel Universe—later appearing on Paradise Island alongside the Flash to stop the Vision, Quicksilver, and the Scarlet Witch from acquiring the Evil Eye of Avalon. He then participates in the fight against Krona's minions in the final battle, fighting Atlanteans alongside Namor, Beast, Plastic Man, and Maxima. John Henry Irons has appeared in Superman: The Animated Series, voiced by Michael Dorn. John Henry Irons is a designer for LexCorp who works to create a prototype suit of powered armor for the Metropolis SCU, but the suit's neural interface system had adverse psychological effects on its user Sgt. Corey Mills. Encouraged by Superman, Irons worked to perfect the suit with the help of his niece Natasha, becoming the superhero Steel just in time to help Superman in a battle against Metallo. The animated Steel is missing the cape he adapted from Superman after he saved John's life in Superman: The Man of Steel #19, and lacks his 'S' shield (although he does wear a jersey with a 5 on the front, a possible homage). In his premiere episode "Heavy Metal", his rivet guns were replaced with forearm-mounted lasers. Steel appeared in Justice League Unlimited, voiced by an uncredited Phil LaMarr. He is seen as a member of the expanded Justice League. Steel has appeared regularly in the company of Superman and Supergirl. His major appearance is when he attempts to hold off Galatea from destroying the Watchtower after she defeated Atom. He is saved by Supergirl's arrival, and after Galatea's defeat Supergirl escorts him to safety. Steel was originally slated to appear in Season 2 of Justice League: Gods and Monsters Chronicles, before the series was cancelled. Steel appears in Young Justice: Outsiders, voiced by Zeno Robinson. In 1997, a feature film was produced based on this version of the character. The film Steel stars professional basketball player Shaquille O'Neal in the title role and Judd Nelson as a new villain named Nathaniel Burke. The film was originally designed to be a spin-off of the new Superman film that used the "Death of Superman" storyline that first introduced the character in the comics. The project languished in development hell for so long, the spin-off moved forward without the film it was to be attached to. The movie (released on August 15) was considered a flop both critically and financially. Steel was produced for an estimated $16,000,000 but grossed $1,686,429 at the box office. A very young John Henry Irons appears in the animated film Justice League: The New Frontier reading a comic book near the gravestone of the "DC: The New Frontier" version of John Wilson, also known as John Henry, who is reportedly killed in the film. An alternate universe version of John Henry Irons appears in Justice League: Gods and Monsters, voiced by Khary Payton. He is depicted as a scientist working in LexCorp's "Project Fair Play". John was discussing with the other scientists involved (consisting of Will Magnus, Michael Holt, Karen Beecher, Pat Dugan, Kimiyo Hoshi, Emil Hamilton, Thomas Morrow, and Stephen Shin) at Karen Beecher's house about what to do after they lost their fellow scientists Victor Fries, Ray Palmer, and Silas Stone. They are all killed by the Metal Men where John Henry Irons was incinerated by the Superdroid. Will Magnus survived as he secretly orchestrated the attack on his fellow scientists. Steel makes a brief appearance in Teen Titans Go! To the Movies. John Henry Irons appears in Justice League: Throne of Atlantis, voiced by Khary Payton. He is seen wielding a hammer and defending a colleague from an Atlantean before he is saved by Superman. John Henry Irons appears in The Death of Superman, voiced by Cress Williams. He prepares his Steel armor during the mid-credits scene after the title event. John Henry Irons appears in the sequel Reign of the Supermen, with Cress Williams reprising his role. He adopts the name of Steel ever since the previous movie. Steel makes an appearance in issue #02 of the comic book tie-in of Justice League Unlimited. British radio producer Dirk Maggs produced a Superman radio series for BBC Radio 5 in the 1990s. When the "Death of Superman" story arc happened in the comics, Maggs presented a very faithful, though much pared down version of the tale, which featured Stuart Milligan as Clark Kent/Superman, Lorelei King as Lois Lane, and William Hootkins as Lex Luthor. John Henry Irons was played by film actor Leon Hebert, who coincidentally appeared as a reporter in Tim Burton's first Batman movie. The story arc was packaged for sale on cassette and CD as Superman: Doomsday and Beyond in the UK and as Superman Lives! in the USA. Steel is a playable character in the side-scrolling beat 'em up video game The Death and Return of Superman for the Super NES and Genesis. Steel appears in the 2002 video game Superman: The Man of Steel, voiced by Billy Brown. Steel appears in the MMORPG DC Universe Online, voiced by Ken Thomas. ^ "The Unofficial Steel Biography". DCU Guide. Retrieved January 28, 2011. ^ Dooley, Dennis; Engle, Gary, eds. (October 1988). "The Man of Tomorrow and the Boys of Yesterday". Superman at Fifty: The Persistence of a Legend. New York: Collier Books. ISBN 978-0-02-042901-2. ^ Stern, Roger. The Death and Life of Superman (novelization of the Death of Superman storyline). Random House Publishing Group, 1994. p. 365. "I knew all along that Superman would return, and now he has. Not necessarily in the form people might have expected, but it was him. Listen, have you ever heard of a walk-in spirit? When a body has been abandoned by one spirit but is not yet uninhabitable, then another spirit can move in. Anyway, whatever he is, the cards tell me for sure that the man who saved me today is definitely the Man of Steel. For sure." ^ Steel #22 (November 1995)—A crossover with the regular Superman titles. ^ "Update 2: DC Nation Panel From WW:LA". Newsarama. March 16, 2007. Retrieved January 28, 2011. ^ "DC's War of the Supermen, A 100 Minute War". Newsarama. Retrieved January 28, 2011. ^ "The characters take center stage in January". The Source. DC Comics.com. October 14, 2010. Retrieved January 28, 2011. ^ "DC Newcomer to Initiate Doomsday Return in Steel #1". Newsarama. Retrieved January 28, 2011. ^ "'Justice League: Gods and Monsters Chronicles' Update: Mary Marvel, Green Lantern To Be Added in the Season 2 to debut in 2016". Venture Capital Post. 2015-05-07. Steel at Don Markstein's Toonopedia. Archived from the original on December 7, 2017.